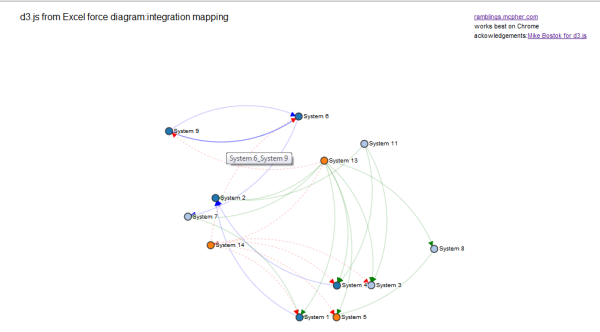 In this case we are going to take a problem faced by many IT professionals - how to visualize integration between systems. The final result looks like this, and the interactive version is here. And for the browser challenged still using IEold, here's a screen shot. This involved a few more parameters than we've so far, so here's the updated parameter sheet. Now all parameters are consolidated into a single parameter sheet , d3allparameters in the cDataSet.xlsm workbook. Just as in Excel tables to d3.js Force diagram, any Excel table will do. We'll use the force fields parameter block to pick out the ones that are to be mapped. Here is the some of the input data for this example. You may want to have different marker and line styles for links. If this is blank then a default style is applied to all links, and there will be no markers. In our example, we are taking the values in the column link Style as different styles. The contents of this column can be whatever you like but you need to later define a style for each unique value. The unique values I have used in the link Style column ads direct, bus and manual. Each one of these should have a marker and path.link description using CSS syntax. In its simplest form, you will be specifying a stroke and fill color for the links and markers as below. In this case, for example, manual links will show up as red dashed lines with a red end marker, whereas bus links will show up as blue solid lines with a blue marker and so on. This is ignored if there is no styleColumn specified. When you hover over a link, specifying a linkName column will cause whatever data is in the given column to be displayed. I will focus on the new options added since Excel tables to d3.js Force diagram. Size of the arrow. A blank value here will mean that the links will have no end arrows. Why not join our forum,follow the blog or follow me on twitter to ensure you get updates when they are available. in the meantime, see what else you can do with d3.js straight from Excel.